The top 9 Chinese internet unicorns and their entry into Southeast Asia. KPCB venture capitalist Mary Meeker published her annual Internet Trends Report at the Code 2018 conference held in California. In spite of a dim picture of slowing growth globally in terms of new added global internet users as a result of an almost 50% market penetration worldwide, China still managed to pull off a strong growth owing mostly to prolific homegrown innovations and services and an increasingly domestic consumption-driven economy. The report noted down nine Chinese internet companies that made it to a list of the global top 20 tech companies by market valuation. Some of them are household names such as Alibaba and Tencent, yet some others – such as Toutiao and Meituan – remain unbeknownst to many who reside outside of China. We’d like to use this article to help explain to the world who those 9 companies are and what they are up to as well as their inspiration to your home market, read on to find out more. Top 20 Global Tech Giants from Mary Meeker’s Internet Trends Report. Almost 2 decades into its foundation, Hangzhou-based Alibaba has transformed itself from an e-commerce site to one of the largest technology companies in China and even Asia that offers overarching services for its customers, ranging from online shopping, mobile payment and fintech products, movie ticketing and online entertainment, innovative physical stores, smart logistics service, among many others. To many people’s surprise, Alibaba, not Amazon, is the world’s largest retailer. It also runs the world’s largest mobile payment platform and money-market fund through financial affiliate Ant Financial, the world most valuable fintech startup. What is Alibaba doing in Southeast Asia? In April 2016, the Chinese e-commerce giant took its first step into the region, via a $1 billion investment in Lazada, an Amazon-like e-commerce company serving 6 Southeast Asian countries. Lazada later, under the guidance of Alibaba, acquired Singapore-based Redmart to expand its business. In 2017, the company continued its push into the region, led a $1.1 billion investment in Indonesian e-commerce startup, Tokopedia. Fast forward to this year, Alibaba has invested up to $4 billion in Lazada and also moved key leaders from Alibaba over to Lazada. For instance, Lucy Peng, one of Alibaba’s 18 co-founders, was transferred to serve as Lazada’s CEO in March 2018. Other than the traditional e-commerce space, Alibaba also has been looking into the ride-sharing market. For example, Alibaba and Grab had their first investment discussions last summer, even though nothing materialized. Interestingly, upon Uber’s exit in Southeast Asia this year, Alibaba was again in talks with Grab, looking at the potential for an investment, according to Techcrunch. Founded in 1998, one year ahead of Alibaba, Tencent is commonly known as China’s largest social networking and gaming giant, the denotation highlights two of the main businesses for Tencent, which is headquartered in Chinese coastal city Shenzhen, a city bordering and south of Hong Kong. It offers a wide plethora of value-added internet services, ranging from instant messaging, social entertainment, social networking, online payment, quick payment, mobile wallet, online games, online reading to online music. The Chinese internet giant also invests heavily in areas of artificial intelligence and machine learning through Tencent AI Lab and Tencent YouTu Lab respectively. What is Tencent doing in Southeast Asia? China’s social networking and gaming giant entered into the Southeast Asia market by becoming the largest shareholder of Sea, predominantly a gaming house. Its second target was betting on Indonesia-based Go-Jek in the hopes of the latter becoming a ‘’super app’’, like WeChat and WeChat Pay. Unlike its archrival Alibaba, Tencent’s social entertainment app, WeChat possesses international reach, with a majority of its 600 million overseas users residing in the Southeast Asia region, especially in Malaysia, with 1/5 of its population being of the Chinese ethnic group. Leveraging on this advantage, WeChat Pay in a foreign currency will be rolled out in Malaysia in the coming months as Tencent has already been cleared for a Malaysian electronic payment license, according to Nikkei Asian Review in January 2018. In early May this year, Tencent led a $1.2 billion funding round in Go-Jek, furthering its footprint in the region. Founded in 2014, Ant Financial, a spinoff from Alibaba, is a fintech company, and as a matter of fact, the world’s most valuable fintech startup with a US$ 150 billion valuation. China’s Hangzhou-based Ant Financial operates Alipay, the world’s largest mobile and online payment platform, as well as Yu’ebao, the largest money-market fund in the world. Some of the latest products last year include Shouqianma and Zhima Credit. The former is a QR code payment targeted for small businesses while the latter is a credit scoring service used to process rental and leasing services. Both these products were well received, with more than 400 million sign-ups for Shouqianma and the credit scoring system serving close to 2,600 merchants by the end of 2017. Daily active users of Alipay increased by more than double in 2017 and its transactions outside of China increasing by a whopping 306%. Ant Financial claims 800 million users worldwide as of May 2018. What is ANT Financial doing in Southeast Asia? Towards the end of 2016, ANT Financial began its significant expansion efforts in the region. Its first endeavor was via a partnership with Thailand’s fintech firm, Ascend Money. The partnership’s goal was for Ant Financial to help Ascend Money to grow its financial services ecosystem, together with online and offline payments. Early 2018, the Chinese fintech giant entered another strategic partnership with Globe Fintech Innovations and Mynt, a leading electronic wallet provider in the Philippines to speed up financial inclusion and upgrade payment services in the Philippines. At the end of last month, Ant Financial acquired Singapore-based payment service HelloPay Group to rebrand as Alipay in markets including Singapore, Malaysia, Indonesia and the Philippines. This move will boost brand recognition of Ant Financial in the region. Other than these efforts, the affiliate of Jack Ma is also looking at partnerships with local merchants who supply services to Chinese travelers and also forming joint ventures with local partners to offer its mobile wallet service via local brands. This would avoid potential roadblocks that might result from obtaining governmental approvals, according to Asia Nikkei Review, the world’s largest financial newspaper. A joint venture with Touch’n Go, a transport smartcard affiliate of the lender, CIMB Group Holdings that will launch this year in Malaysia and a partnership with Indonesia’s Elang Mahkota Teknologi, to roll out a mobile payments services, are some examples. Established in January 2000, Baidu is a Chinese language internet search provider. Its online platform allows users to search for information online, serving both individual internet search users and business users searching for customers. There are many channels available for users to connect to, including popular vertical search-based products such as Maps, Image Search, Video Search and News Search. It also functions as a media platform for its online marketing customer, providing a full range of marketing options. While the deep understanding of the Chinese culture has given the company huge comparative advantage and accounted for its local success, Baidu’s international products are also gaining traction. It is constantly innovating to meet the changing needs and diverse tastes of its users, reflecting its corporate culture to be simple and reliable. Baidu is also one of the first Chinese internet powerhouses to dive into the A.I. field, currently, Baidu has engaged in self-driving, smart assistant, visual recognition among other domains. It also runs one of the largest A.I. open platform in China with an aim to open its article intelligence to partners and enrich the whole ecosystem. What is Baidu doing in Southeast Asia? Baidu first ventured into Southeast Asia via a Singapore-based research center in 2012. It was a joint partnership with the Institute for Infocomm Research, a research arm of Singapore’s Agency for Science, Technology, and Research, aiming to carry out language and speech-related research. Fast forward to this year, it launched yet another joint venture with a Singapore-based company, Asia Mobility Industries (AMI) bringing its self-driving tech to Singapore, establishing an “Apollo Southeast Asia’’ fund. Baidu aims to commercialize its technology in the Southeast Asia region via investments in advanced mobility projects and technology exchange to support autonomous driving and intelligent transportation in land scarce Singapore. Other than research work, the Chinese search engine also invested in areas such as Tourism in the region. Just last year, already in its second year of partnership with the Ministry of Tourism of Indonesia, more Baidu products such as Baidu Search Engine, Display Ads, and Baidu Travel, were launched in the hope to attract more Chinese tourists to the region. The maiden partnership year had produced very impressive results, according to Minister Arief Yahya of Indonesia. Founded in 2010, Xiaomi, a Chinese smartphone maker, is a firm believer in creating affordable quality products for the masses. This strategy was responsible for its successful international expansions and has cemented its dominance in Indonesia and India. It also offers a range of other consumer electronics and internet services. Despite a setback in 2016, Xiaomi’s shift towards the physical stores and development of artificial intelligence and internet service led to a stunning 2017. Today, with up to $3.4 billion raised to date, it is headed for an imminent IPO at the Hong Kong bourse and has also recently opened new stores in Paris & Italy. While it is predominantly a smartphone maker in China, Xiaomi’s vision is to become an internet company in the future. What is Xiaomi doing in Southeast Asia? Xiaomi started entering Southeast Asian markets, four years after its inception, beginning with Malaysia and Singapore, joining other smartphone makers like Apple and Samsung. Other Chinese smartphone makers such as Lenovo and Huawei also have big plans for the Southeast Asian market. By the 3rd quarter last year, Xiaomi’s market share for the region has grown to 7%, with shipments growing nearly 80%. Late last year, Xiaomi also started to sell its products in Thailand. Fast forward to Q1 of 2018, Xiaomi is already at a 2nd place in Indonesia’s smartphone market, the largest market in the region, growing a whopping 1455% year-on-year growth from Q1 2017. Founded in 2012, Hangzhou-based Didi Chuxing designs, develops and operates China’s top mobile transportation app. It utilizes big data-driven deep-learning algorithms, creating a platform that’s capable of allowing users to choose from taxi hailing, private car-hailing, Hitch, Didi Chauffeur, Didi Bus etc, across 400 cities in China. In line with news last December, according to Reuters, Didi Chuxing has launched a website to recruit drivers and passengers, and will go live in April in Mexico, its very first overseas expansion beyond China. As a young private startup, it has raised up to $20.1 Billion to date, making up to 5 acquisitions and is also said to be in talks for a multi-billion dollar IPO, according to people close to the matter. Didi completes 30 million rides on a peak day in the past May, according to the company’s presentation onstage at a Morgan Stanley 4th annual China summit. What is Didi Chuxing doing in Southeast Asia? The ride-hailing giant’s first foray into Southeast Asia, was via joining a $2.5 billion funding round for Singapore-based ride-hailing giant, Grab. Founded in 1998, JD.com, commonly known as Jingdong, is a Chinese e-commerce giant. It provides a one-stop e-commerce platform for customers to gain access to a vast selection of products across every major category ranging from electronics, FMCG, fresh food to home furnishings at competitive prices. Its nationwide fulfilment infrastructure and last-mile delivery network ensures speedy and reliable delivery services for its users. JD.com is also committed to research and development to enhance the retail experience. For instance, the company has a Silicon Valley R&D Center in Santa Clara, CA, bringing together top talents in sectors such as machine learning, cloud computing, big data and artificial intelligence, to develop cutting-edge innovations for service enhancements. What is JD.com doing in Southeast Asia? China’s online retailer, JD’s first stop for its international expansion plans was Indonesia, the largest market in the Southeast Asia region, back in 2016. Riding on the cheap labour, JD rapidly opened 4 storehouses there within a year, with workforce tripling. After which, in November 2017, Jingdong further its push in the region, by leading a $19 million investment in Bangkok-headquartered, online fashion brand Pomelo. The latter’s business focused mainly on Thailand, Indonesia and Singapore. In February 2018, JingDong entered a joint venture with Central Group, the number one retail brand in Thailand. It was a US$500 billion investment each, to deliver a new online shopping platform for Central Group. The move to Thailand can also serve as a hub to penetrate into other regional countries in the region such as Vietnam and Malaysia. The latest push into the region was done early this year – by co-leading the financing of Vietnamese e-commerce firm Tiki.vn, with VNG Corp, a Vietnamese entertainment and social media firm. While Tiki.vn can leverage on JD’s expertise in social media for e-commerce, JD.com is looking to add the Vietnamese firm’s warehousing and delivery system, its technology and payments capabilities into its own ecosystem. Founded in 2015, via a merger between Beijing-based Meituan and Shanghai-based Dianping, respectively modeled after Groupon and Yelp, Meituan-Dianping is a Chinese mobile internet company operating a local life information and trading platform. The company has successfully evolved from the ‘’Groupon+Yelp’’ combination to become a ‘’super-app’’, offering a wide variety of services from group-buying deals, travel packages, food delivery to ride-hailing, becoming a platform for any thinkable online-to-offline service. Having raised up to $8.3 Billion to date, the company is also rumored in talks for a potential Hong Kong float, citing people familiar with the matter. This could be due to the pressing need to store up its war chest for its group buying pure play, expanding into the turfs of other big players in movie ticketing and ride-sharing. What is Meituan-Dianping doing in Southeast Asia? Following rumors that Meituan-Dianping to be exploring options to enter the Indonesian market in end July 2017, the Chinese lifestyle app company was found to be amongst the tech giants investing in Indonesia’ ride-hailing and online payment startup, Go-Jek this year. Meituan-Dianping can ride on Go-Jek’s expansion plans in the region, as the latter has recently announced plans to enter Singapore, Vietnam, Thailand and the Philippines in the coming months. Furthermore, its acquisition of bike-sharing company, Mobike, will allow the company access to the Singapore market. Founded in 2012, Toutiao, or Jinri Toutiao, leverages on advanced technologies such as machine learning and data mining to integrate the most relevant contents for users via a feed reader. Its recommendation system product is built on thorough analysis of data obtained via social networking accounts. While it does not have original writers, it works like a distributor, feeding news content to its targeted audience. It also utilizes the network effect, providing short videos to attract its users, allowing user to share content as well. The news aggregator company has raised up to $3.1 Billion to date. In 2017, the platform has already registered 120 million daily active users. What is Toutiao doing in Southeast Asia? Tik Tok, the international version of TouTiao’s Douyin, has expanded rapidly in the Southeast Asia region, reaching more than 10 million installs in Google Play since end February. This short-video social platform is indisputably one of the top video playing apps in the region, ranking consistently as top 10 across large markets in the region, namely Indonesia, Malaysia, Thailand and the Philippines. Already making waves amongst the young people back in China, Tik Tok is likely to enjoy a huge potential to grow in the region, with 30% of the population between 18 to 24 years of age, compared with 8% in China. Southeast Asia has a total mobile-ready population of more than 620 million, which will be an important generator of growth over the next two decades. 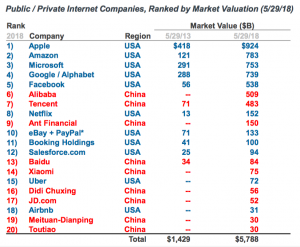 Interestingly, only 2 countries – the United States and China, dominate the internet services sector. With all of the 9 big Chinese players growing their presence in Southeast Asia, the battle between the tech giants of the United States and China to gain prime access in this region has started and is very much alive.